The council displays as many historic artefacts as it can within its various museum and exhibition facilities, but this can only represent a small proportion of its wide ranging collections. 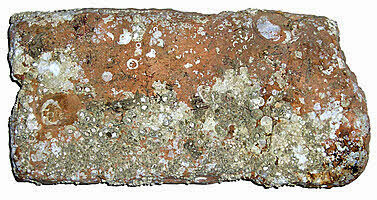 This page will detail some objects of interest which might otherwise remain unseen. A new item will be added each month. Pears was a British artist, best known as a marine painter. From a set of 25 Players coloured cigarette cards depicting yacht classes of the late 1930s. 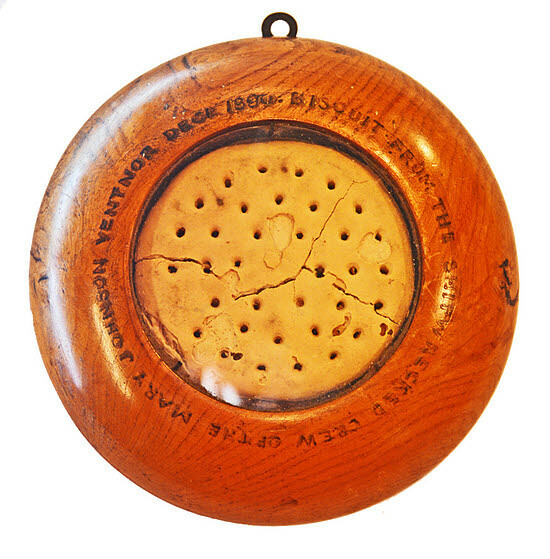 A circular wooden frame with glass front within which is contained a 4 inch ship's biscuit. A weevil can be seen in the biscuit. Around the frame are the words 'From the shipwrecked crew of the Mary Johnson, Ventnor, Decr 1890'. From the J.B. Williamson Collection. A pair of iron manacles recovered from the wreck of the White Star liner 'Laurentic' which was sunk by two German mines off the coast of Northern Ireland at Lough Swilly on 25th January 1917. RFA Racer, formerly HMS Racer of Osborne Naval College, was the salvage vessel used to salvage Laurentic. At the time of her sinking Laurentic was carrying 43 tons of gold bullion (3211 bars) from England to Canada to pay for war munitions. Racer started a secret salvage operation five weeks after the sinking; an operation which lasted until 1924 and salvaged 3186 bars. A further salvage operation in 1932 salvaged a further five bars, 20 bars are still unaccounted for. The manacles were donated by the coxswain of the diving launch at the wreck of 'Laurentic'. Three early 19th century copper beakers or money cups from St Thomas's Church, Newport. The Sociable Barouche was constructed by Cheverton Coach makers, circa 1880, at the Royal Carriage Factory, Lugley Street, Newport, Isle of Wight. This carriage was commissioned by Queen Victoria as a gift to her daughter Princess Louise, Duchess of Argyll. This particular carriage was in use by the Princess at Kensington Palace, until she gave up her carriage horses around 1930. It is an unusual example, having the facility to close the folding leather head against the removable glazed front and side panels. 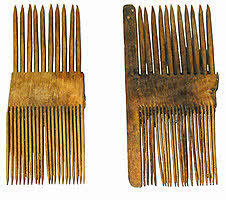 These panels are still present, and so give a conventional and attractive appearance when fully opened. The design includes the usual hinged and padded back rest to cover the rear facing seat. It is a fine example of carriage builder’s art, having an elegant shallow body, elliptical rear leaf springs and iron bonded wheels. 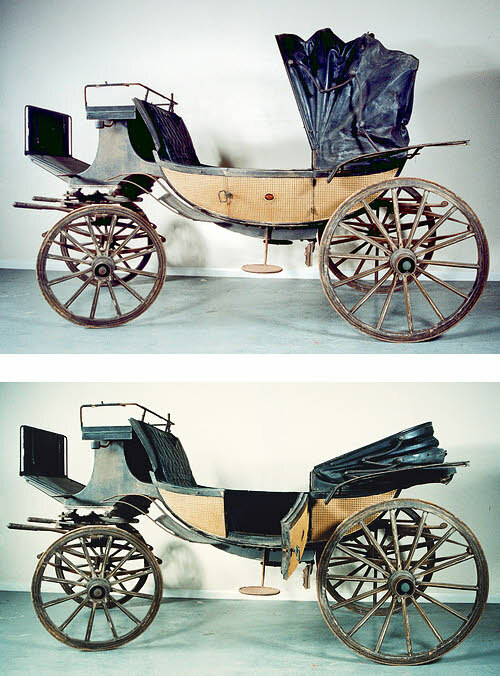 A barouche was a fashionable type of horse-drawn carriage in the 19th century. A steel seal with ivory handle. The seal comprises a ship motif surrounded by an inscription. The mirror image is on the right. The seal dates from the 16th century. 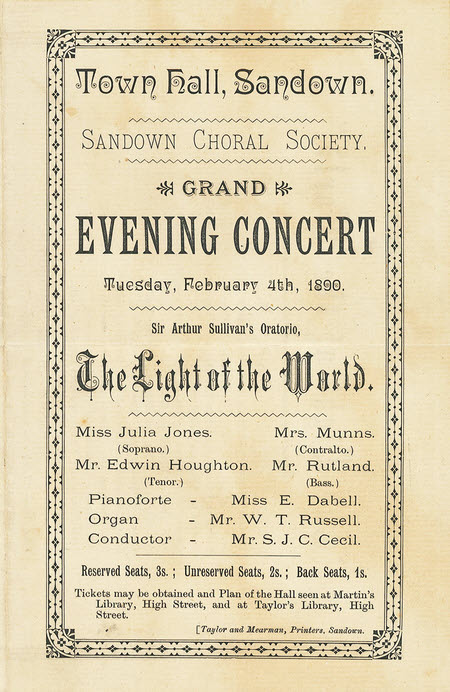 A music programme for a grand evening concert at Sandown Town Hall by the Sandown Choral Society, on 4th February 1890. 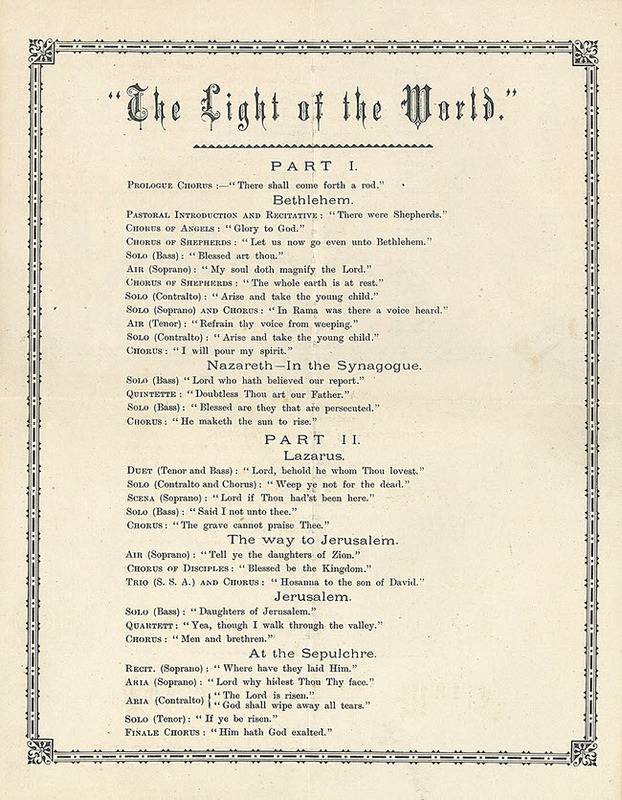 The society performed the oratorio 'The Light of the World' by Arthur Sullivan 1842 - 1900. Performers included Miss Julia Jones - Soprano, Mrs Munns - Contralto, Mr Rutland - Bass, Mr Edwin Houghton - Tenor and Mr S.J.C Cecil - Conductor. The reserved seats cost three shillings, the unreserved two shillings and the back seats one shilling. The story of the oratorio narrates the whole life of Christ, focusing on his deeds on Earth as preacher, healer and prophet. The oratorio was inspired by William Holman Hunt's popular 1853-54 painting, The Light of the World. Composed in 1873, the work was first performed at the Birmingham Festival on 27 August 1873. Built by Pollit and Wigzell of Sowerby Bridge, Yorkshire. Used from new until 1964 in a wood merchant yard at Newport, providing sufficient power to drive the entire yard's machinery. This is the only single cylinder engine of its type known in existence. 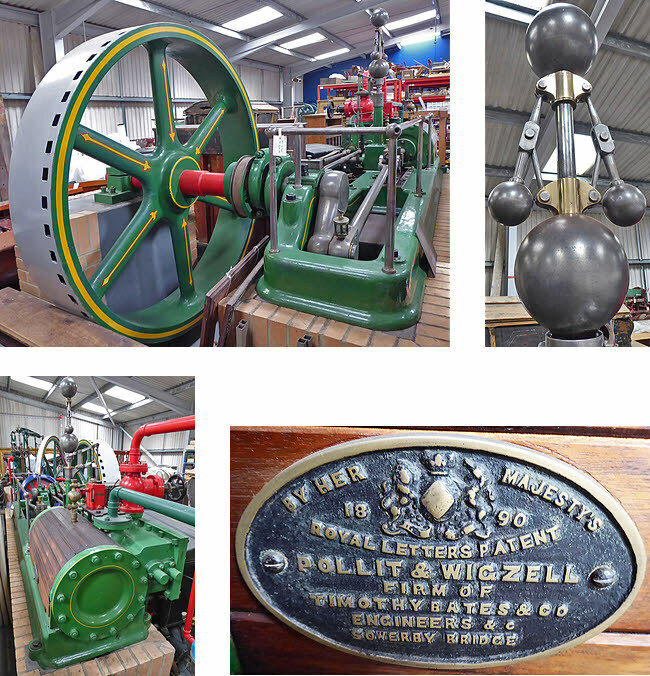 Pollit & Wigzell was a well-known maker of quality stationary steam engines. Their sales were generally confined to the northern counties of Yorkshire and Lancashire and powered many of the cotton and woolen mills. Four trade tokens from a collection of 89 tokens and medals. 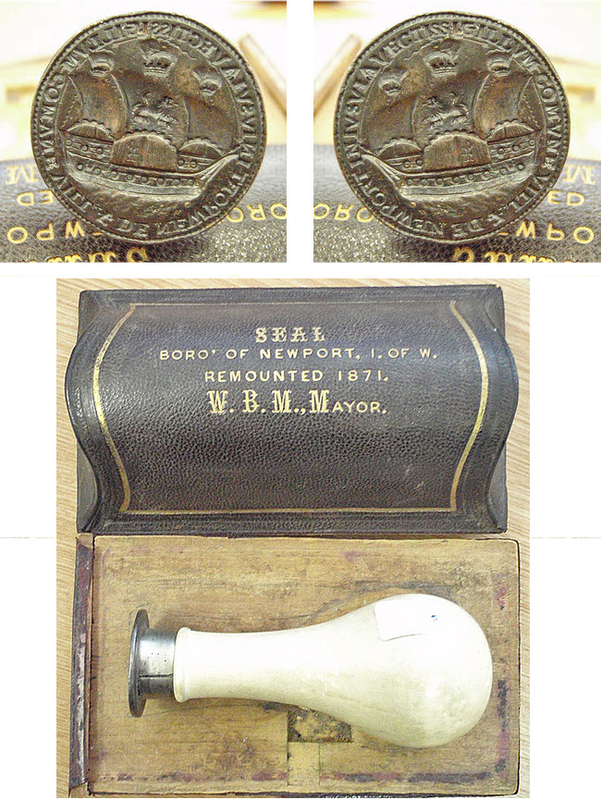 Trade token issued by Newport Town Council. Circa. 1660. 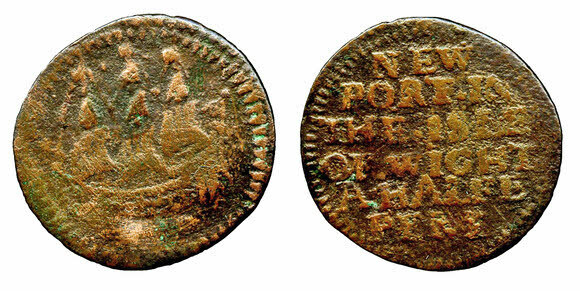 Obverse - 'Newport in the Isle of Wight A Halfe Peny' (Half Penny). Reverse - an image of a galleon. Trade token issued by Stephen Barton in 1664. Obverse - 'Stephen Barton of Newport SEB'. 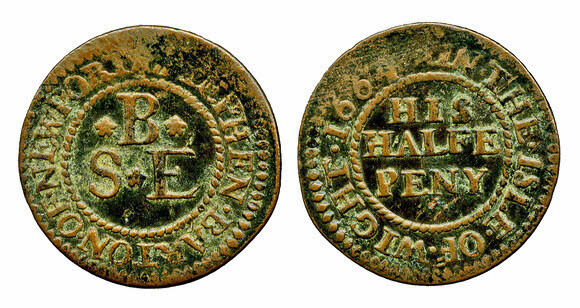 Reverse - 'In the Isle of Wight 1664 His Halfe Peny' (Half Penny). Halfpenny trade token issued by Robert Bird Wilkins of Newport dating to 1792. Obverse - 'Robert Bird Wilkins' illustrated with a profile head. 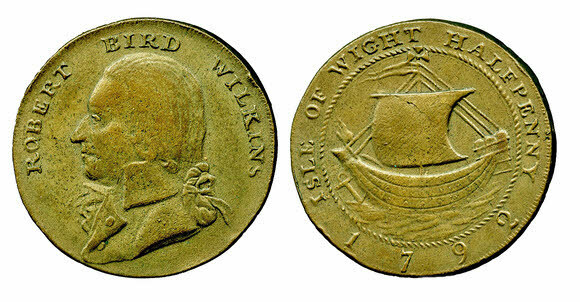 Reverse - 'Isle of Wight Halfpenny 1792' illustrated with the ship from the Newport arms. Around the edge are the words 'Payable at his Office Newport'. Trade token issued by the Anchor Brewery dating to 1851. 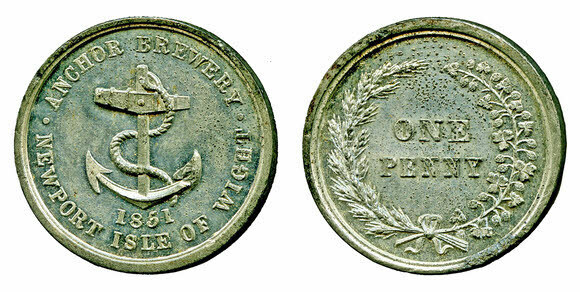 Obverse - 'Anchor Brewery Newport Isle of Wight 1851'. Reverse - 'One Penny' along with a wreath. Built by Easton and Amos, Engineers of Southwark, London. The company was founded by Charles Edwards Amos and James Easton in 1837. This engine had a Royal career, commissioned by Prince Albert as a water pumping engine in Queen Victoria's home at Osborne, East Cowes. From 1904 to 1962 it was employed as a winch in a Cowes shipyard. Grasshopper beam engines are beam engines that are pivoted at one end, rather than in the centre. The text stamped around the edge of this light switch reads - "Presented by the Directors of the Isle of Wight Electric Light and Power Co Ltd to F. Rayner Esq. July 19th 1904". 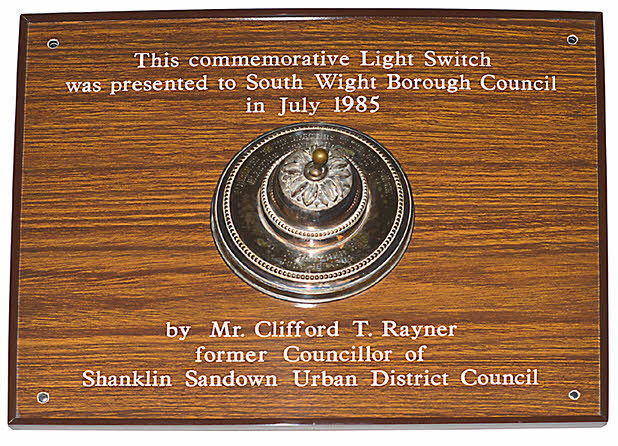 The switch was later mounted onto a laminated board by Mr Clifford T Rayner (believed to be the son of F Rayner) and presented to South Wight Borough Council in 1984. This light switch is one of the quirkier items from the Heritage Service collections. Shipwrecked Fishermen and Mariners Royal Benevolent Society. 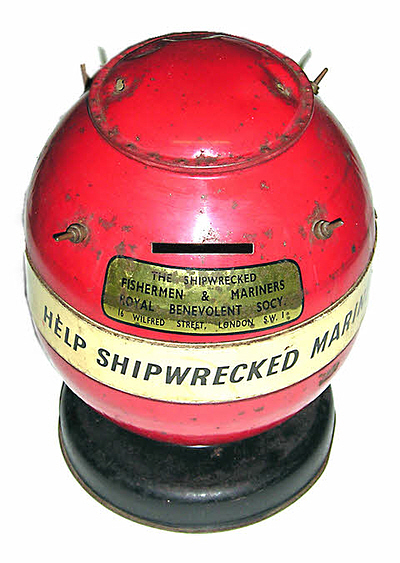 This small collection box is based on real sea mines that were converted into collection boxes and placed around the coast of Britain. The Society has provided financial assistance to fishermen and mariners and their dependants who have suffered hardship, misfortune or poverty, as a result of an accident, illness, disability, unemployment or retirement. 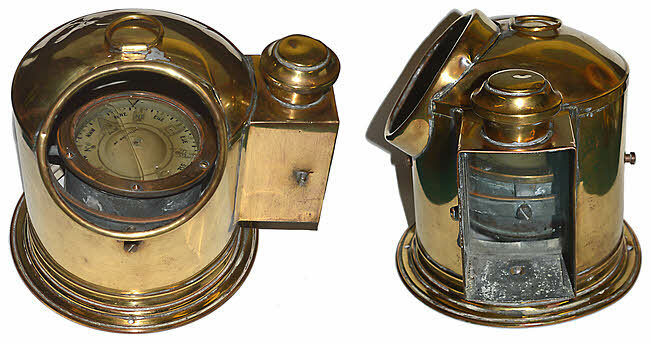 A brass binnacle of customary helmet form, enclosing a liquid Sestrel compass made by Henry Browne & Son Ltd, of Barking, London. The compass is numbered B4/1117L/45 and its card is marked with the cardinal points. Set in liquid it is placed in a gimbaled support so that it always stays level even with the movement of the ship. It is viewable through a round window (the glass is missing from the casing), and illuminated by a side paraffin lamp that would be accessible by a hinged brass door (the door is missing). 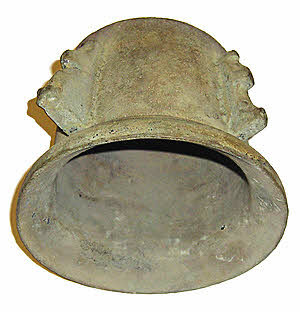 It has a carrying handle at the top, but could also have been bolted in a stationery position by a flange at the base. Late19th - Early 20th Century. The Heritage Service collection holds four pewter plates and four silver serving spoons from the House of Industry, Newport. All of the plates are engraved 'H.I.' (House of Industry). 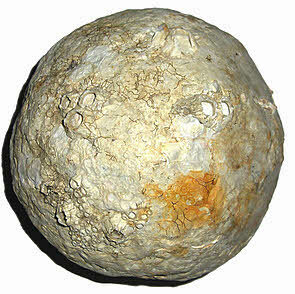 23cm diameter. 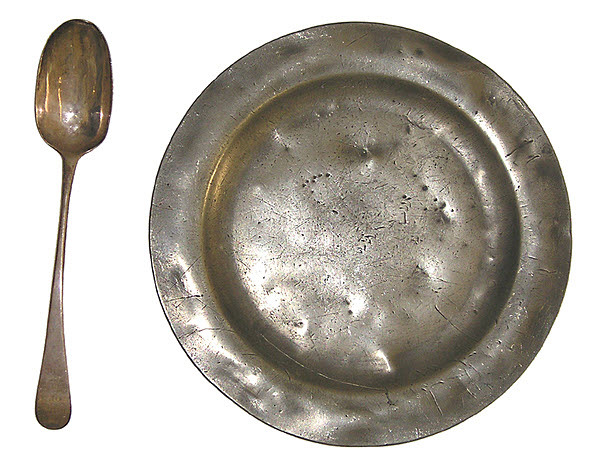 Two of the spoons are engraved 'House of Industry 1792' and the other two 'H.O.E.' 22cm long x 4cm wide. Hallmarked. In 1774 one of the earliest workhouses in Britain opened in Newport. The elderly, infirm and disabled, the unemployed, widows, unmarried parents and their children, orphans and the young were incarcerated within its walls in conditions similar to those found within gaols. It would not be until 1930 that the workhouse would officially be dissolved, although many would continue to live there. Today the buildings are used by St Mary's Hospital and are Grade II Listed. 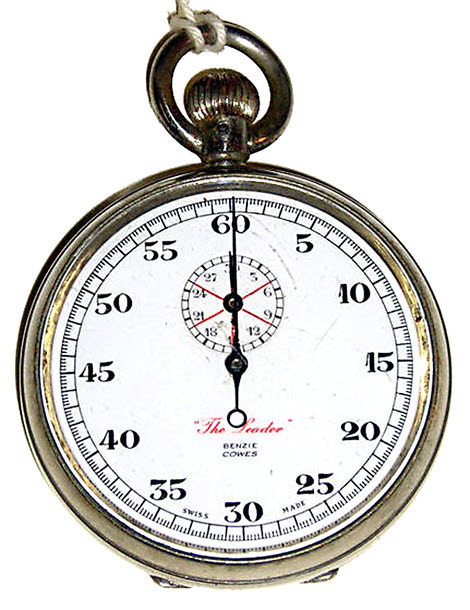 This stopwatch belonged to Uffa Fox, marked 'Benzie Cowes'. Born at East Cowes. When aged fourteen he became an apprentice with a local boat builder. He studied naval architecture and mathematics at evening school. Aged 21 he set up his own boat building business, acquiring an old 'floating bridge' and roofing over the central part to provide a workshop. His first major success, as a designer, was with the "National 14" racing dinghy. In Cowes Week 1925 'Ariel', his first design, won every race in her class. Uffa was the father of the planing dinghy. In 1927 he designed and built 'Avenger'. With greatly increased speed she was far ahead of her time. In 1928 she made 57 starts winning all but five. The Heritage Service conservator cleaned the bell and returned it to its original condition. This brass ship's bell comes from the Trinity House Vessel Stella. Stella was built in 1961 by J. Samuel White & Co. Ltd of Cowes. The Mermaid Class lighthouse tender was one of four built to replace older steam-propelled vessels. Stella was stationed at Penzance. The bell was kindly donated to the Island Heritage Service by John Bonnett of Flintshire, who repatriated the bell from Brazil where the vessel was being scrapped. The manufacture of the communications cable started in early 1857 and was completed in June of that year. After many attempts to lay the cable (with it often snapping) between Valentia Harbour in Ireland and Trinity Bay in Newfoundland the cable was successfully laid on 5 August 1858. The two continents were joined. A letter accompanying these objects state it is a part of this first cable. The mechanical log recorded the speed and distance run by a ship, which was vital information in recording daily progress. It worked by being thrown overboard and dragged behind the ship. As it was dragged along, the log rotated and the revolutions registered on the dials on its side. This example is made of brass with an enamel plate for the three dials, which are marked in miles from 0 to 100 in tens, from 0 to 10 in units, and from 0 to 1 in quarters. Each of the five fins at the back is inscribed with an anchor above the letters 'T W' (for Thomas Walker). From the 16th century onwards people had made many attempts to devise a mechanical log which would automatically record speed or distance, but it was only in 1802 that the first commercially successful version was patented by Edward Massey (1768-1852). It consisted of a brass rotator linked to a geared mechanical recording mechanism. Massey's design was further refined by Thomas Walker (1805-71) and his son, also Thomas (1837-1921), who took out a patent for the A1 Harpoon Log in 1861. 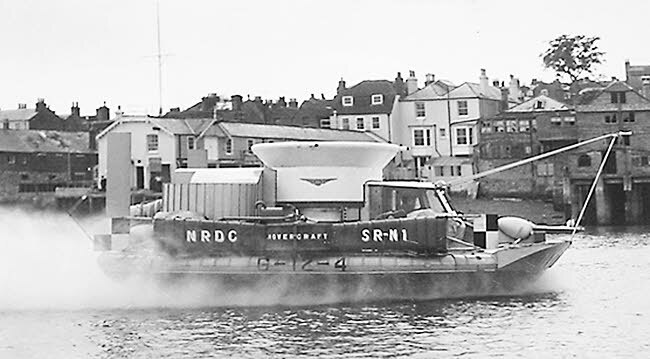 Model - NRDC Saunders Roe built SR.N1 hovercraft with long flexible skirts fitted. The SR.N1 hovercraft in Cowes Harbour. Sir Christopher Cockerell 1910-1999 (front row - right) with the SR.N1 hovercraft. The hovercraft began its life in 1955 when its inventor, Sir Christopher Cockerell tested out his idea for a floating/flying craft. To test his 'hover' theory Sir Christopher placed a cat food tin inside a coffee tin. He then blew a jet of air through the gap between the two tins. This created a cushion of air and the hovercraft was born. Constructed in East Cowes, it took eight months to build SR.N1 (Saunders Roe. Nautical No1). The 20ft craft first took to the seas on 25th July 1959, crossing the English Channel from Calais to Dover in two hours with Christopher Cockerell on board. A set of six buttons from a police officer's uniform, mounted on red velvet within a gilded frame. The buttons bear the Newport town crest and were presented to a police sergeant upon his retirement from the force. Attached to the reverse of the frame is a letter from the Newport Town Clerk, Arthur S. Estcourt, addressed to Sergeant Salter (19th century in date, although the corner with the date on is missing). The letter is informing Sergeant Salter that he has been appointed to the position of Second Mace Bearer upon the retirement of Sergeant Jolliffe. 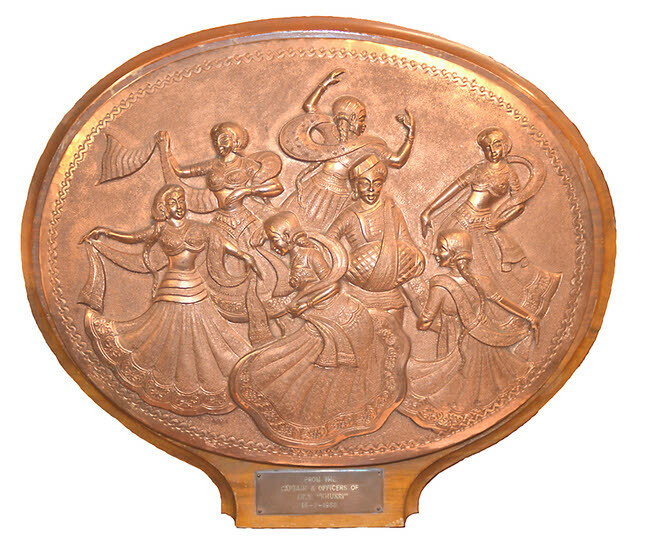 This plaque was presented to J.S White's of Cowes by the Captain and Officers of the Indian anti-submarine frigate INS Khukri on 16 July 1958. INS Khukri was a British Type 14 frigate built by White's for the Indian Navy. Launched on 20 November 1956 she was commissioned in July 1958. In accordance with Indian tradition the ship was launched with a lady breaking a coconut on the bow of the vessel. During the Indo-Pakistani War of 1971 she was sunk on 9 December off the coast of India by the Pakistan Navy submarine Hangor. This was the first warship sunk in action by a submarine since World War II. It remains the post-Independence Indian navy's only warship to be lost in war to date. This is one of many gifts in the Council collections presented to J. S White's by the crews of ships built in the Cowes yards. The tin opener was invented in the 19th century by Henry Knight of Ryde, Isle of Wight. What came first - the tin can or the tin opener? Canned food had been around long before Knight invented the tin opener. The process of preserving food in cans (originally made of wrought iron) was developed early in the 19th century. For decades the instructions for opening cans involved a hammer and chisel. By the middle of the 19th century cans of lighter materials created the opportunity for a tin opening device. In 1881 Henry Knight patented his tin opener. He described himself as an importer of Italian sculpture and owned the Arcade in Union Street, Ryde. Knight sold the patent for his tin opener to Crosse and Blackwell who brought it into common use. Knight had several patents to his name, including a horse clipping machine and an automatic weighing machine. A member of Ryde Town Council, he earned little from his inventions and following the failure of his import business was declared bankrupt in 1890. Henry Knight died in 1895. He may never have guessed that with the rise of convenience foods his adapted tin opener would become one of the world's most familiar kitchen tools. 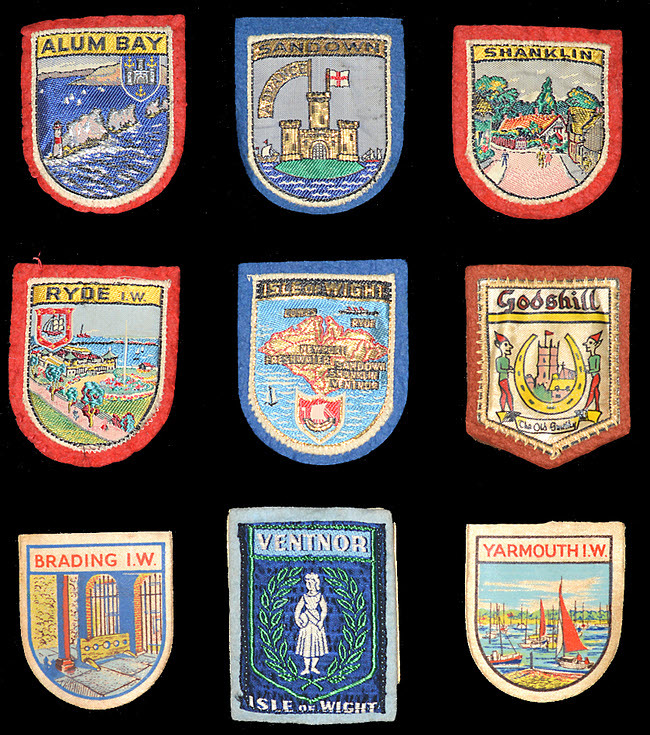 These fabric badges depict assorted locations from around Isle of Wight. The production of sew/stick-on souvenir badges seems to have started in mainland Europe during the early 20th-century, probably in Germany shortly after the First World War when hiking became popular, and people began sewing badges of resort towns onto their backpacks and jackets. Wine coolers were originally made of wood. This is a miniature silver plated reproduction of a Georgian Wine Cooler with lion's heads holding the handles. The front of the cooler has an engraving of an SR.N4 hovercraft and is marked 'Super 4 1979'. It comes complete with its own box which is stamped with the date 25 July 1969. The cooler is 75mm high. Circa 1969 - with later engraving. You can see a model of Hoverlloyd's SR.N4 Hovercraft - GH-2008 St Christopher in Cowes Maritime Museum. GH-2008 was named Sir Christopher (after its inventor Christopher Cockerell). The craft cost between £1.75 - 2 million and was built in East Cowes. It made its maiden commercial flight on 3rd July 1972. 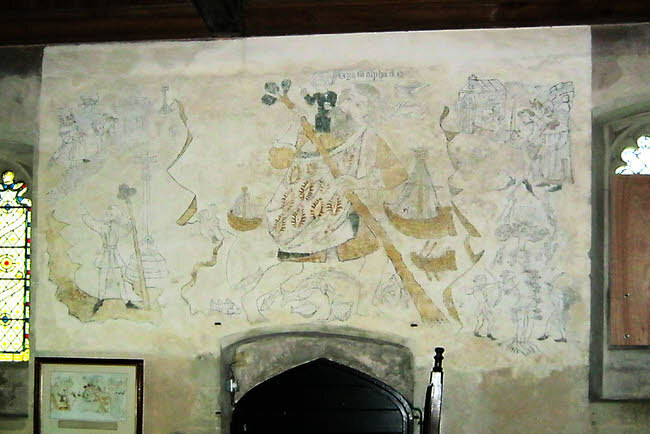 This hand coloured drawing depicts the medieval wall painting of the Life of St Christopher that is located above the north door of St Peter's Church, Shorwell. The saint is shown bearing the Christ Child across a river. Other scenes from his life appear on the left and right, including the attempted martyrdom of the saint with arrows, one of which flies back to pierce the King of Lycia in the eye. Also depicted are some accurately painted 15th century ships, a boat with oarsmen, a man seated on bank fishing and various fishes. 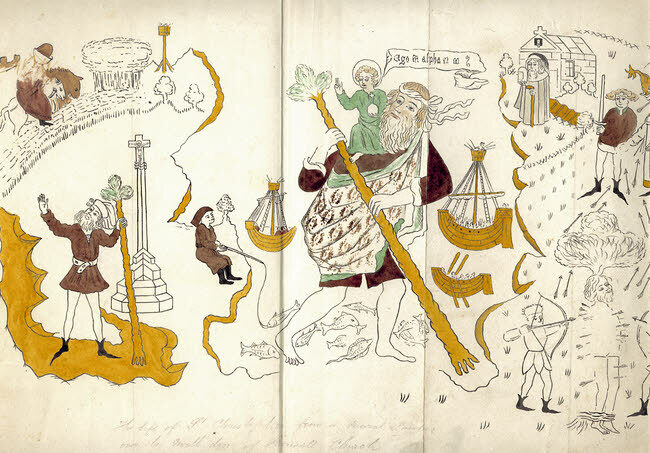 The artist of the drawing is unknown and it is not dated. Repainted in places, the Shorwell painting has been dated to around c. 1470. One of the biggest breweries on the Island was established by the Mew family in Newport, centrally placed to serve most of the Island. Later, Mew-Langton's became famous for their canned IPA. 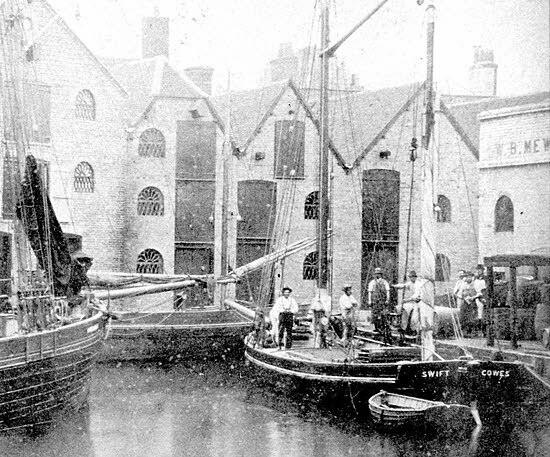 barrels at W.B Mew Langton & Co, Newport Quay, circa 1880. This metal drinks' tray promotes Mew's Ales and Stouts and features a yellow outline map of the Isle of Wight. The Mew family were brewers at Newport from the early 17th century. A name plaque inscribed W.B Mew Langton & Co., Ltd. The plaque comes from one of the boats that transported Mew Langton's beer across the Solent to Lymington. From the brewery of W.B Mew Langton & Co Ltd, Royal Brewery, Newport, Isle of Wight. A seal matrix was used to make a mark in hot wax to seal letters and documents. The letter could not be opened without breaking the seal. The seal usually identified who the letter was from. This seal matrix was found near Arreton, Isle of Wight by a local metal detectorist in 2006. The find was reported to Frank Basford (Finds Liaison Officer of the Portable Antiquities Scheme) and declared as Treasure. The seal matrix is over seven hundred years old, dating from the late thirteenth to early fourteenth century. 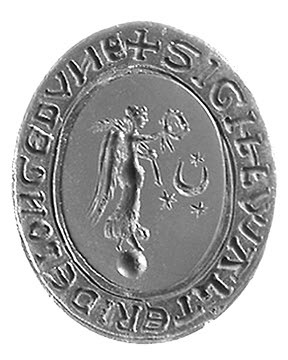 The seal matrix reads SIGILL WALTERI DE LONGEDVNE (Seal of Walter of Longdown). The seal matrix may have belonged to a wealthy Medieval Islander but unfortunately there are many Longdowns in the south of England so we cannot accurately state whereabouts Walter came from. (Longdown is a common name for a long chalk down). The case and surround of the seal matrix is made of silver. The matrix would have been worn around the neck. Walter of Longdown chose a very fine intaglio for the centre of his seal matrix. The red jasper gem was engraved in the Roman Period around the first century AD. The intaglio would have come originally from Italy or the East but where Walter obtained it from will probably remain a mystery. Roman intaglios of this high quality are very rare. 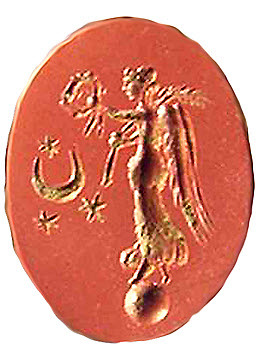 The intaglio shows the Goddess Victory standing on a globe. (Victory was a Roman goddess who would crown the victorious with a wreath made from leaves). She is winged and holds a wreath in her right hand and a palm-branch in her left. In front of her there are three stars and a crescent moon, which represent eternity. The carving probably represents the eternity of Imperial Victory. The goddess Victory was very popular with the Roman army. The engraving could represent how the Roman Empire believed they would be victorious and rule the world forever! Similar images have been found in the Temple of Sulis Minerva at Bath. Walter of Longdown was probably a wealthy, well-educated man of the Middle Ages. He would most probably have been aware of the Roman meaning of the engraving. However he could have easily re-interpreted the figure as an angel and the stars as the heavens glorifying in the birth of Jesus Christ. The seal matrix was purchased by the Isle of Wight Council Heritage Service in 2007 with assistance from The Art Fund and the MLA/V&A Purchase Grant Fund. 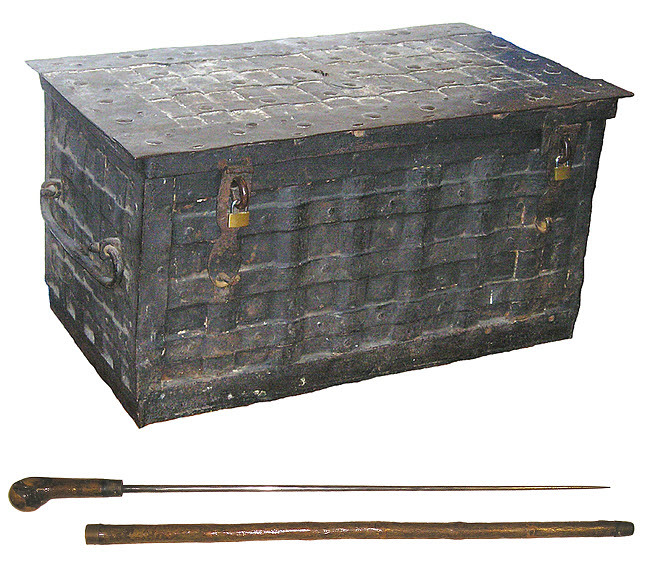 The King's Chest or Armada Chest was used to store monies and valuables collected by HM Customs. These chests were issued to Customs Houses as a protective measure since it was not unknown for smugglers to burn down a Customs House. Chests of this type were in use from the 1790s until quite recently. This steel stick with its hazel wood handle was used by Customs men for probing material while searching for smuggled goods (for example bottles of brandy hidden in woollen bales).When fitted inside the hazel wood sheath it resembles a walking stick. East and West Cowes quickly became busy trading ports. The visiting ships often had to pay a tax depending on the contents of their cargoes. Model of hydroplane powerboat: Bluebird K3. Bluebird K3 is a hydroplane powerboat commissioned in 1937 by Sir Malcolm Campbell, to compete for the world water speed record. The boat was designed by Fred Cooper and built by Saunders Roe at East Cowes on the Isle of Wight. K3 set three world water speed records. On 1 September 1937, at Lake Maggiore on the border between Switzerland and Italy, she set a record of 126.32 mph. The next day she improved this to 129.5 mph. The following year the 130 barrier was broken, when on 17 August 1938 at Lake Hallwyl in Switzerland Bluebird K3 reached 130.91 mph (210.63 km/h). 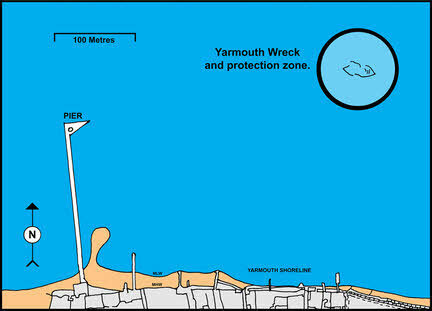 This historic wreck was first discovered off Yarmouth in 1983. She was found during an archaeological survey. 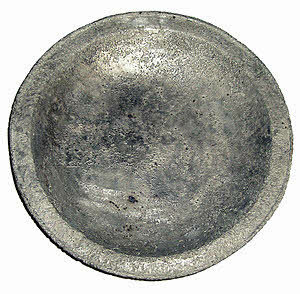 When archaeologists found three pewter plates associated with the wreckage, they were able to date the site to the 16th century. It was soon realised that this was an important discovery and was designated as a 'Protected Wreck Site'. Archaeologists of the Isle of Wight Maritime Heritage Project carried out the underwater investigation between 1984 and 1989. Excavations established that the ship was once a thirty metre long merchant carrack, and possibly of Spanish origin. The project researched into the possible identity of the wreck. Many hours were spent visiting archives and studying documents, in search of written records of a 16th century ship being lost off Yarmouth. Eventually, a reference to a Spanish ship was found in the High Court of Admiralty Records. In 1567 the 'Santa Lucia', a Spanish carrack, was sailing to Flanders with a cargo of wool. The ship 'by fortune perished and was lost in the seas thwart of Yarmouthe in the Isle of Wight'. Reports stated that the cargo had been salvaged. 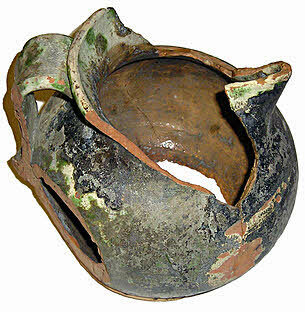 However, an impressive variety of artifacts were excavated from the site. Is this the Yarmouth Roads Wreck? Photographs show objects found at the site of The Yarmouth Roads wreck. General Sir James Willoughby Gordon was secretary to the noble 'Duke of York' who had ten thousand men. He lived at "Northcourt", near Shorwell, Isle of Wight, with his wife Isabella Julia Levina (Bennett), whom he married in 1805. Sir James loved carving and created the large number of carved poppy heads added to the original seventeenth century pews of Shorwell church. Lady Isabella was an accomplished artist, a pupil of Turner; she subsequently studied under David Cox and probably Thomas Girtin. Her watercolours include paintings of Northcourt. 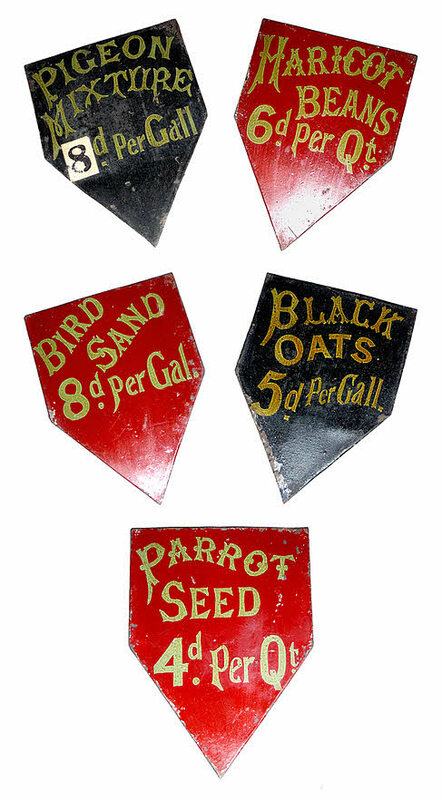 These painted metal signs come from Duffett's who had shops in Garfield Road, Bennett Street and 6, High Street, Ryde. An advert in Kelly's Directory 1904 reveals Duffett's were merchants for coal and coke, corn hay and straw, flour, oatmeal, bird seed and dog biscuits. During the Victorian period Alum Bay sand paintings were popular tourist souvenirs from the Isle of Wight. Sand pictures first became popular on the Isle of Wight around 1840 when an important centre for their production was established at Newport. Local artists had 21 different coloured sands available from the cliffs at Alum Bay and produced views of the Island and its attractions. They featured local beauty spots, sea views, historic houses and local churches. 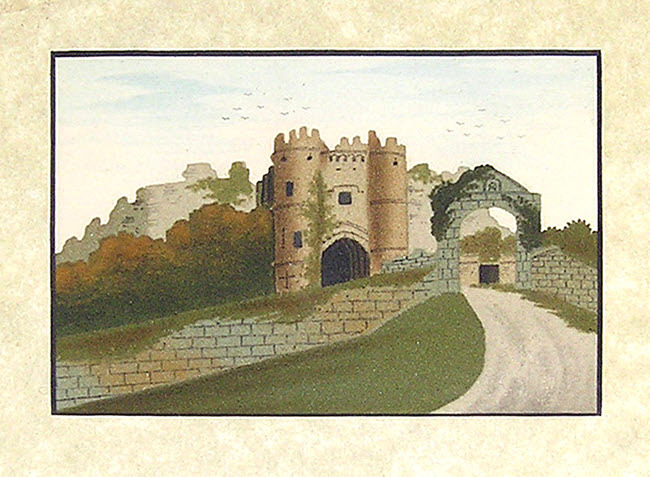 Hawkers sat at the entrance to Carisbrooke Castle and sold these paintings to visitors. 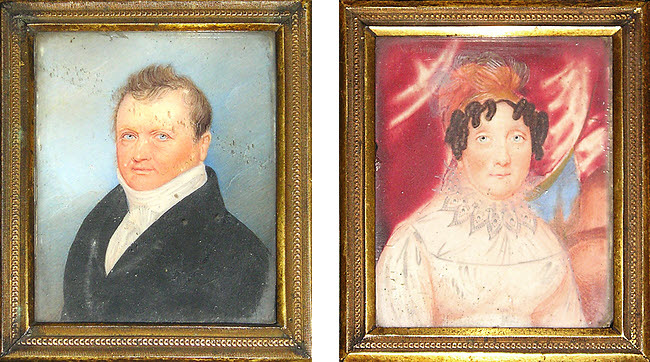 The County Archives have a reference to a blind man selling these pictures in the late 1870s. The art of 'painting' with coloured sand or 'marmortinto' was carried out from the early part of the eighteenth century. Unfortunately, the secret methods the artists used died with them. 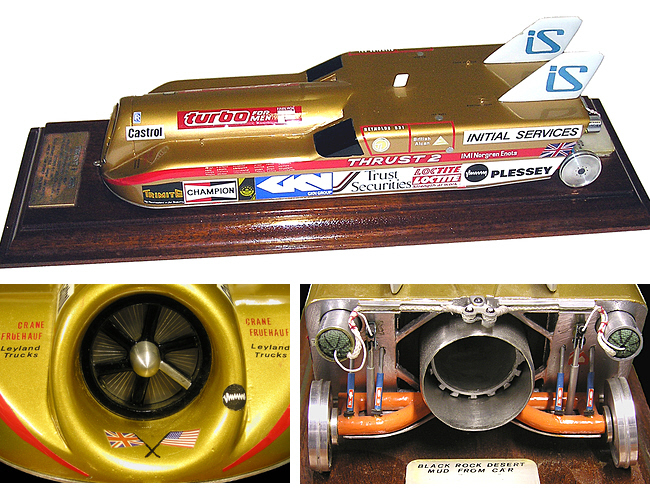 On Tuesday 4 October 1983, Thrust 2, driven by Richard Noble, broke the World Land Speed Record. The record speed was 633.468 miles per hour (1,019.4 kilometres per hour). This remarkable vehicle was designed and built at the Ranalagh Works at Wootton Creek, Isle of Wight, by a team of highly skilled and devoted Island based engineers. This model of Thrust 2 was made by team member Brian Ball. At the rear of the model is a plastic box containing mud from the Black Rock Desert, Nevada, USA. The mud was taken from the car after its record-breaking attempt. In 1974, Richard Noble founded Project Thrust and started building Thrust 1, the first British jet car. Unfortunately, this car crashed when a wheel bearing failed during a high-speed run at RAF Fairford, Gloucestershire (March 1977). It was sold for scrap the very same day. Undaunted, that evening he began work on Thrust 2. Richard brought in outside help to construct Thrust 2. John Ackroyd, the designer, joined him and slowly a team of 25 dedicated people was formed. They managed to secure £1.7 m worth of sponsorship in cash or kind from some 200 British companies. Thrust 2 consisted of a tubular space-frame chassis containing a single Rolls-Royce Avon jet engine. The engine came from an English Electric Lightning fighter aircraft. The car first ran in 1980 and on 24th Sept 1980, obtained the British land-speed record of 248.87 mph at RAF Greenham Common, Berkshire. On the 4th October 1983, Richard Noble and Thrust 2 broke the world land speed record. On the vast expanse of the Black Rock Desert in Nevada, he averaged a speed of 633.468mph (breaking the previous record of 622.407mph set in a rocket car in 1970 by Gary Gabelich). The Theatre Royal stood in St. Thomas Square, Ryde. The original Theatre Royal was present by the early years of the 19th century and the re-built theatre was opened on Boxing Day night 26 December 1871, under the proprietorship of a Mr W. Brown. Reports told of a beautiful ornate auditorium capable of seating some 1,000 people. The theatre saw the actress Miss Ellen Terry (1847-1928) make her debut as Puck in "A Midsummer Night's Dream." Destroyed by fire on the night of Monday 19 May 1961, the theatre remained in ruins for many years until it was eventually demolished in 1981. Today the site is occupied by a branch of the Nat West Bank. 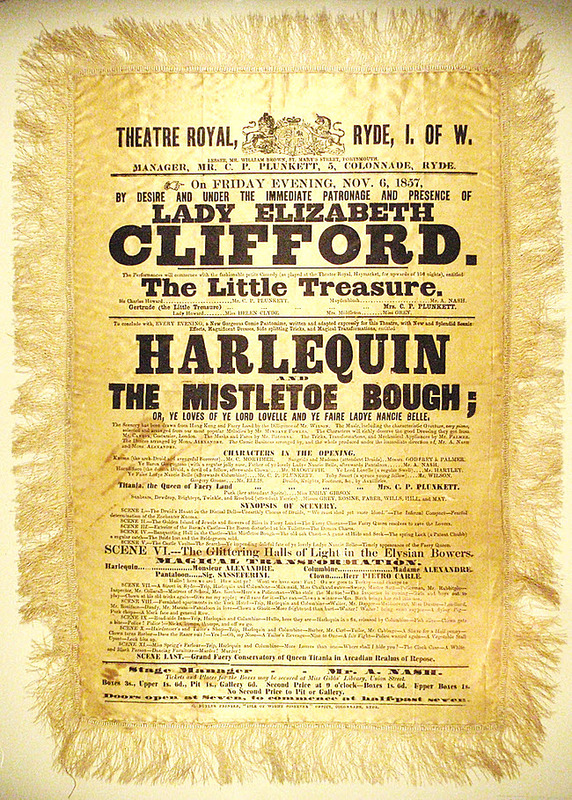 The silk poster advertises the production of "The Little Treasure" a fashionable petite comedy followed by "Harlequin and the Mistletoe Bough" a comic pantomime written and adapted expressly for the Theatre Royal. The tale of The Mistletoe Bough is a ghost story that dates back to the 18th century, and was traditionally recited at Christmas time as a ballad. The story tells how a new bride, playing a game of hide-and-seek during her wedding breakfast, hides in an attic chest and is unable to escape. She was not discovered and suffocated. The body was allegedly found many years later in the locked chest and by that time was just a skeleton in a wedding dress. The leading actress for these productions was Mrs. C. P. Plunkett. The evening was "by the desire and under the immediate patronage of Lady Elizabeth Clifford" who was the wife of Sir Augustus Clifford of Westfield House, Ryde, who were some of the leading figures in the town at the time. 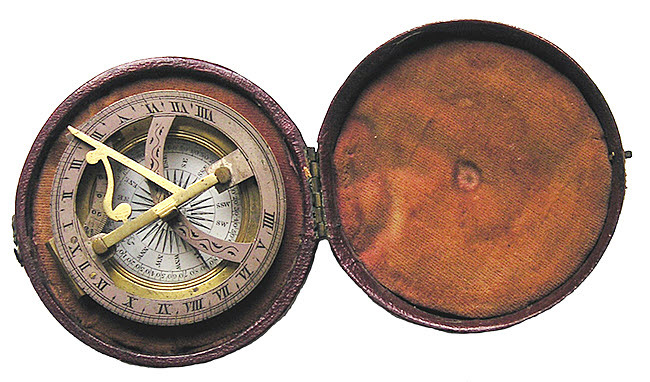 An 18th/19th Century pocket compass and sundial housed in a circular leather covered case. 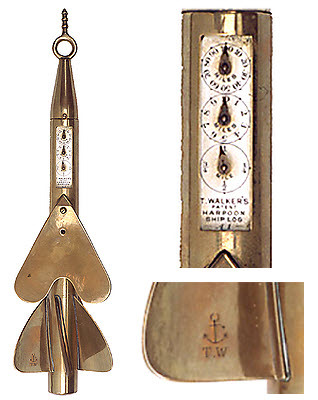 The compass was owned by Mr Thomas White (1773-1859). In 1803, Thomas White, an established shipbuilder from Broadstairs in Kent, relocated to Cowes, Isle of Wight. White acquired Nye's yard and eventually took over yards on both sides of the River Medina at West and East Cowes. Over the following years, Thomas and his sons ran various shipyards both individually and in partnership. It was not until 1860 that all of their yards were combined under the name 'J Samuel White'.